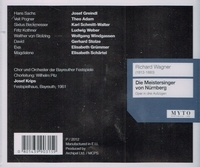 NB: We have received the following note from a buyer of this performance: "the performance billed as Bayreuth 1961 conducted by Krips, appears to be a mixture of performances. The Sachs in the last part of Act 1 (and Act 2) is Neidlinger, I'm not sure who the Walther is, but it's not Windgassen...I'm guessing it's from the 1957 performance, and thus Geisler. It seems to revert back to 1961 for Act 3, at least what I've heard of it, so it appears that Myto incorrectly identified CD 2." “Theo Adam was one of the leading bass-baritones of the post-World War II era, particularly well known for his Wagnerian rôles. His professional début was at the Dresden State Opera in 1949, which led to a guest appearance in the 1952 Bayreuth Festival, which was also the year he joined the Berlin State Opera. Despite the handicap of living in the Soviet bloc, Adam was selected in 1963, after a few appearances in smaller rôles, to sing the rôle of Wotan in Wagner's RING at Bayreuth in 1963. He later sang the other major bass-baritone and bass rôles in many Wagner operas, including Hans Sachs, King Mark, Amfortas, and the Dutchman. Adam was also well known for the rôles of Baron Ochs, Pizzaro, Wozzeck, King Philip, La Roche, Don Giovanni, and other important parts. "[Weber's] voice was of fine quality, with an even scale and extensive range. [Weber’s] long-breathed legato line, splendid, florid technique, and dramatic gifts ensure that all the excerpts on this very full CD give huge pleasure. What they cannot show is the sheer brilliance and size of the voice. He could astonish the listener with the power of his forte and then switch to a beguiling pianissimo, which carried easily to the farthest parts of the opera house. It comes as no surprise to learn that early in his career he sang several performances with the incomparable baritone, Mattia Battistini, who remained his idol and model all his life….For those who enjoy superlative bass singing, this is a ‘must’.